We have some good reliable Chefs who have just come in to us looking for there next move . David who is a local lad is looking for a Head or Sous chef position within the Dorset area . Just arrived back from a 6 month contract running a hotel in Tunisia . 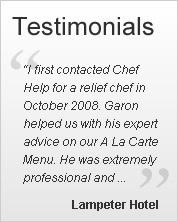 I have worked with David and good chef very reliable good communicator . Ready to go now !